If you shop at Amazon, would you use one of the links below to do your shopping? The link in the blue bar above also works. We get a small commission on what you buy. Even though they’re small, at the end of the month they add up, which helps fund this newsletter and our projects. Thanks. 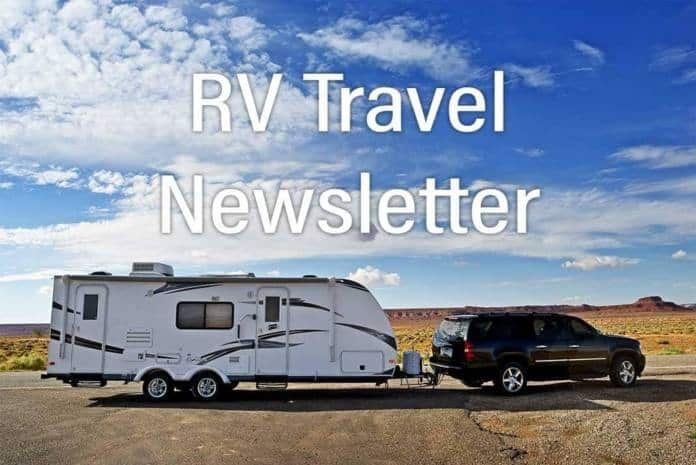 PLEASE, IF YOU ARE AN RV TRAVEL MEMBER (voluntary subscriber) who received an email from us yesterday, would you please visit here? We confused some of you and need to explain. If you are a member but did not receive the email, please let us know so we can be sure you are on our list for special content and other services. Welcome to the 874th edition of the RV Travel Newsletter, and the first with our brand-new design. You should find the site much easier to navigate now, and it certainly looks a lot better. We still have a few bugs to find and fix. Please let us know if you find anything. Email us at editor@rvtravel.com. The update took us off-line for six days last week, frustrating but in the end well worth the wait. We had been working on the update for months (and are still not finished). We have many new features coming in the months ahead. Most readers know that Gail and I recently bought a house near Seattle after two years of full-timing. We’ll travel a few months a year for awhile. When we set out on our full-time adventure, we never meant it to be forever. I needed to see how the other half lives. In two years, I did just that. It was an incredible learning experience. A reader wrote me last week to say he sensed I had a bias toward full-time RVers. I don’t know where he got that idea, but it’s not true. Frankly, I do not even know the definition of a full-time RVer. Who is such a person? First, did you know if you live full-time in an RV you really don’t live in a recreation vehicle? If your RV has a small RVIA seal outside your door (most do), then, by definition, you have an RV. Well, maybe not. . . So if you live in an RV full-time, you don’t, by definition, live in an RV. So what is it? Beats me (we’re working on a feature story about this). I can tell you, however, that many insurance and warranty companies will not insure you or honor a claim if they discover you live year-round in your RV. Are you covered? You better check the small print in your policy! So who is a full-time RVer? Is it someone who chooses to live 365 days a year in a nice RV park or resort in, say, a fifth wheel, trailer or motorhome? Is it someone who lives in a “park model” RV year-round? Is it a person or family that lives in an old RV in a seedy RV park because a home or apartment is beyond their means? Is it someone who moves their RV only twice a year to follow the sun, say from Minnesota to Arizona or Vermont to Florida and then back? Is it a family that lives in a fifth wheel for months on end and moves only when the breadwinner’s job relocates to a new location? Is it poor people who buy a junker RV, living in it on city streets until the cops kick them out? What do they have in common with a well-off retired couple in their $350,000, 45-foot diesel pusher? Kitchen in Jayco Eagle, as well equipped as one in most traditional homes. I know full-timers who never move. I recall one woman I met whose husband had died and she didn’t want to keep the house. She decided to sell it and live in a fifth wheel. She bought it, then hired someone to tow it to an RV park where she would live indefinitely. Is she a full-time RVer? Do I have a bias against full-time RVers? Absolutely not. I think it can be a fun, adventurous, rewarding life and I envy those people who make it work. But, at the other extreme, some “full-timers” live by necessity in RVs that barely function: It’s a whole lot better than sleeping in a cardboard box on a city street. How do you lump all these lifestyles together into a single “one size fits all” term? Who do you believe qualifies to be called a full-time RVer? Take this 15-second poll. I’M VERY INTERESTED IN HOW we live in these modern times and how RVs will increasingly fit into our lives. The word “camping” should not be associated with anyone with an RV with an air conditioner or TV. Even a half century ago “camping” meant taking a break from how we lived in our traditional homes. RVs today, even those of modest size, have every creature comfort we have at home and often a lot more. Some even have balconies so we needn’t get our shoes dirty when we step outside. P.S. : We have a new contact email: editor@rvtravel.com . Our entire staff will monitor this and whoever is most qualified to respond will do so. I have become overwhelmed with email and cannot get to it all, which makes me feel guilty (and I hate feeling guilty!). And a reminder: We are still looking for editorial help, but not necessarily “writers.” We’d like to find an RVer or two with solid English and Web browsing skills who’d like a part-time income. Their job will be to scour the Web, social media and YouTube looking for nuggets of news, information or technical advice that we can pass along to you or use as starters for articles. So if you spend a lot of time poking around the Web reading about RVing and want to get paid for it, please let us know at editor@rvtravel.com . Finally, I am thrilled to report that my friend Greg Gerber is returning as owner and editor of RV Daily Report, an online RV trade publication that he sold in July, 2017, to inexperienced publishers who were ill-prepared for the challenges. Greg is one of the last RV journalists who freely speaks his mind, not just kiss up to industry executives. I hope he and I can work together to do more to improve the lives of you and other RVers. Read more. Sign up for Mike Sokol’s monthly RV Electricity Newsletter or any of our other newsletters here. Next edition of the RV Electricity Newsletter arrives tomorrow! We’re not too popular with RV industry bigwigs these days because we aren’t afraid to speak out honestly about things we see wrong in how they manufacture and sell their products. Our readers help make our efforts possible by becoming members with their “voluntary subscriptions.” Even a pledge of $10 or $20 a year is appreciated — that’s for more than 50 weekly issues (add another 208 if you read our RV Daily Tips Newsletter)! Many readers set up an ongoing membership, most $5 to $10 a month. But even a one-time contribution of whatever you feel is fair helps make it possible for us to write about important matters, not just fluff to please advertisers and RV industry big shots. Will RV parks nix fixed prices and charge based on demand? Is the day coming, perhaps very soon, when RV parks will no longer charge a fixed price for a campsite, but a variable price based on the demand at the moment? RV park owner Andy Zipser discusses this idea, which many park owners see as a way to increase their profits based on supply and demand. Read Andy’s article. • Armed man barricades himself in RV in 8-hour standoff with police. • NorCal’s horrific Camp Fire 100% contained, officials announce. • Colorado Springs, Berkeley, and San Diego confront homeless RV dwellers. • Winegard® DISH® Playmaker™ OS 2.1 with HDTV available now. • German RV component company Truma picks Elkhart County for its U.S. HQ. • RV shipments decline in October. • Keystone recalls trailers for tire rubbing problem. • Montana fifth wheels recalled: disc brakes could fail. • Forest River recalls RVs for driver window shade problem. DISNEY STILL HASN’T RESPONDED to our request about a dangerous power pedestal at its Fort Wilderness RV Park. Read the story and what’s dangerous. Can it be — shipments of RVs actually declining after eight straight years of growth? According to a news release from the RV Industry Association (RVIA), analyst Richard Curtin, a professor at the University of Michigan’s Survey Research Center, predicts 2019 shipments will range between 439,800 and 466,000 units with the most likely total to be 453,200 units. That would represent an annual decline of 5.4 percent. Learn more. Attorney Steve Lehto, who is one of America’s experts on RV lemon laws, explains how some RV dealers are charging their customers up to $2,000 to inspect the new RV they’re buying. They don’t offer it as an option, but say it’s required by law. No, it’s not. Watch the short video. Recent advertising from Camping World is sporting a new logo with a halo, but it’s no longer over the head of the iconic Good Sam Man. What’s up? Is Marcus Lemonis, the CEO of the club and Camping World, slowly retiring the Good Sam Man and just retaining his golden halo? Read more. This was posted in our Facebook group RV Horror Stories by group member Charmon Kelley Poche. We thought it was so good we posted it for more RVers to see. She wrote: “If you are an RV owner, especially a lady, you need to pony up and learn how to fix things. We all know RVs are cardboard stapled together with cheap parts, so knowing that, what’s next?” Read more. Do you carry a paper map or road atlas of where you’re traveling? RV co-pilots, how does your driver drive? Pretty well! You usually don’t stay in one RV park for too long (maybe a month or so), you love (I mean, really love) memory foam beds, and you probably didn’t inspect your RV’s roof before you bought it. Click here to read. If you use a surge protector when you plug in your RV (you absolutely should! ), it’s a good idea to secure it so a thief can’t steal it. We hear reports at RVtravel.com quite often from readers whose surge protectors disappeared during the night or when they were away from their RV. Here’s a way to secure it, as well as some more tips from savvy readers in the Comments below the article. The campground of your dreams? No way! Oh, this is way too funny — a publicity photo from the REV Group, the third largest motorhome manufacturer in America. Maybe a little Photoshop going on here? If such a scenic campsite did exist, how much do you think it would go for? This ain’t no $60-a-night spot, that’s for sure. You won’t believe where the spectacular scene was actually shot! Good luck finding an RV anywhere near there! Check it out! Something must have smelled good to a hungry grizzly bear as it passed by a travel trailer in Alaska. Actually it must have smelled very, very good because the powerful animal ripped off half the RV’s side to get to the bounty. Read more and see a bigger photo. Rich “The Wanderman” isn’t covering his motorhome this winter like he usually does – he’s assembling a big fabric building to store his RV in! Find out what he bought, it’s advantages and disadvantages (so far), and how the assembly is going. Read more. Any RVer that has been on the road for awhile likely has a dog-eared and ragged copy of Don Wright’s “Guide to Free Campgrounds,” especially boondockers and those that seek out off-the-beaten-path locations. It’s been four years since the latest edition, and much has changed and been added. Read more, and maybe order a copy of the brand-new 832-page tome for yourself or for a Christmas gift for your RVing friends. 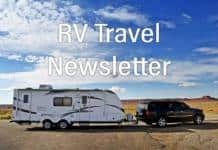 It’s no secret to most RVtravel.com readers that it’s getting harder each year to find an available space in an RV park without a reservation days, weeks, months or even a year ahead. And so here’s some good news, at least for RVers who stay at KOA campgrounds. Learn more. • Nine words RV buyers must insist be written on their sales contract. • RV driver dies from tire blowout. Prevent it happening to you. • How to protect yourself from ungrounded power. • Setting tire pressure on cold days? • What we learned about you last week (November 10-16). • Concept motorhome expands with 4 slideouts and a mini fold-out tent. • Explore the Southwestern deserts – but don’t try to see everything. Where can I find a Dometic fridge part? Has anyone had experience finding parts for a Dometic refrigerator with a removable freezer compartment? If so, where can they be found? Comment here. I have a nice home on 15 acres in a pleasant neighborhood. My adult son needs to regroup. He does better if he has space and privacy. I am at the age where I had been thinking of getting a lightweight trailer for me for weekends, etc. I have a Dodge Ram 1500 EcoDiesel. I would like to look for a used good quality trailer under $10,000 that would be decent for my son to live in with good heat and insulation. Comment here. Click the image to play the movie’s trailer. Here’s the perfect stocking stuffer – Lucille Ball and Desi Arnaz go RVing! In this 1954 classic, “The Long, Long Trailer” – in gorgeous Technicolor, the famous couple (as newlyweds) hit the road in a 40-foot travel trailer. The result is hilarious! The scene in which Lucy tries to cook in the moving trailer is a classic! This DVD is a great gift for your favorite RVer! Click the DVD cover to see the movie’s trailer or order for only $11. Change from week before: Down 7 cents; Change from year before: Up 1 cent. Change from week before: Down 2 cents; Change from year before: Up 34 cents. Facebook poster Renee Lastimado was at the Walmart Supercenter in Irvine, California, and posted this: “I finally found a Walmart that has the cute RV jammies. The store on Technology Drive in Irvine. Get ‘em while you can! !” Other Facebook followers immediately responded that they’d found the same sleepers in Walmart stores across the country. Don’t count on them sticking around for long! Here’s a recent Stray Voltage Patrol report that has a happy ending. What’s great about this situation is that the campground immediately replaced the entire pedestal box (not just the circuit breaker). What did our SVP member report and where is this very responsive KOA located? Find out here. A motorhome owner needs to buy new RV tires and asked some questions regarding changing the ply range, UV protection, brands to steer clear of and available discounts. Read Roger’s answers. As the temperatures drop and the nights get longer, a favorite constellation dominates the night sky. Orion is one of the pictures in the sky that most people can recognize and name almost to the level of the Big Dipper (Ursa Major). It’s big and very easy to find. Learn more. Boondockers Welcome is a great alternative to expensive, crowded RV parks or even Walmart parking lots. With a membership you can stay free in your RV at more than 1,000 private property locations across America. And, wow, will you meet some great people! Learn more or sign up. Not your daddy’s sausage gravy. When you have a tub of this kicky gravy in your fridge you can do anything with it for any meal of the day. Heat it to serve over biscuits or pancakes for breakfast, over baked potatoes or polenta for supper. Pep up a vegetable side dish by folding in some of this sauce. Toss it with hot pasta, top it with crisp croutons or serve the gravy over crunchy toast. Get the recipe. Fix it in Foil! Tasty Recipes. Easy cleanup! Easy prep, great taste, good nutrition, quick clean-up! “Fix it in Foil” includes 51 fantastic recipes to make in foil — plus instructions for cooking in an oven, on an outdoor grill, or on a campfire. Fix it in foil and forget about scrubbing pots and pans. And, with plenty of substitution suggestions, enjoy a whole new list of recipe possibilities! Great for RVing! Learn more or order. With these smartphone/GPS devices in our pockets all the time, there are now many different ways to share your location. Maybe you’re a full-time RVer with kids who worry about you a lot. Rather than calling or emailing them every day, you could let them see your position on a map that they could look at as often as they like. Learn how easy it is here. … from Geeks On Tour. Tune in tomorrow (Dec. 2) to watch the live webcast: #157, Sending photos from your phone to friends or contacts. Here is the previous webcast: #156, How to use a smartphone to scan documents and create PDF files. Watch live or archives of past programs. FULL BORE: To sell an RV for the full sticker price with no discount. To this day, no one knows how Edward Leedskalnin created the Coral Castle. Ed would only say that he knew “the secret of the pyramids.” When he died, his secrets died with him, and to this day scientists and thinkers still debate Ed’s methods. From 1923 to 1951, Ed single-handedly carved over 1,100 tons of coral rock at night and in secret, and his unknown process has created one of the world’s most mysterious accomplishments. “You are about to see an engineering marvel that has been compared with Stonehenge and the Great Pyramids of Egypt,” touts an information sheet available at the site. Visit the museum website here to plan your visit. After an online vote in 2011, Toyota announced that the official plural of Prius was Prii. The choices were: “Prius,” “Priuses,” “Prii,” “Priem,” or “Pri.” “Prii” received 25%. The English language is pretty strange and confusing. It can be understood through tough thorough thought though. Editor and Publisher: Chuck Woodbury. Managing editor: Diane McGovern. Senior editor: Russ De Maris. Staff writer: Emily Woodbury. Contributing writers: Greg Illes, Bob Difley, Richard Miller, Richard Mallery, Janet Groene, Gary Bunzer, Roger Marble, Mike Sokol, Chris Guld, Julianne Crane, Chris Fellows, Dennis Prichard, J.M. Montigel and Andrew Robinson. Advertising coordinator: Gail Meyring. Marketing director: Jessica Sarvis. IT wrangler: Kim Christiansen. Previous articleWho would you label a “full-time RVer”? Next articleRV Electricity – Just how bad are the campground pedestals? Yea, the new format is great, aside from a few glitches, but my biggest gripe is the faint type. The Escapees magazine went to the same type recently as well. Problem is your readership demographic is probably 50+ and our eyes are not as efficient as they used to be! The new site is very nice on my Android phone. However, that said, I hate change! I always like the old no matter how bad it may be. I always figure a way around the bad. I will get use to the new and will hate when you want to improve it. LOL. “motorHOME” is the industry term. Thus a home. I have lived in a stick built house my entire life thus far. In the very near future, my wife and I will be full-time RVers and still working ‘normal’ jobs. Not camping, but living/traveling with all our wants and needs with us. OCD suited living. Let it be! I have been “full timing” for 3 years now. That is, I live in my RV 365 days a year, traveling all over the continent. I am insured with GEICO, who insures full timers. My understanding is that the reason all RV’s are classified as recreational vehicles, 3 seasons, is that if you classified them as full time you have to building them according to the building code. I agree with Dennis. The first thing I do when I open the newsletter is to go to reader view to take away a lot of the clutter. Hi Steven, I use reader view myself when I’m trying to read a lot of text. It’s really useful. For those that don’t know about this feature of your browser, in the address box (or right next to it) there is usually an icon that shows up that looks like a page with text on it. Clicking that gives you a clear view of the page and makes the text larger! Great for us folks with three sets of glasses! I like the new design but I do not like the constant pop up of another item (which I have already read) on the right side. Very annoying. Also when I click on “read the story here” type of link, I wish it would open in a new tab, although it is not difficult to go back to the main page, I just forget I have to do it. Otherwise, I’m still enjoying reading this newsletter each week and also the daily blurbs too. Keep on keepin’ on! Hope all y’all have a great, happy holiday season! That “continuing” pop-up is extremely annoying, to say the least. Otherwise, your new design newsletter is right-on !! Yes, it WAS annoying. It’s out of here! We were hoping to give you a little more access to stories related to the one you were reading. But that said, it wasn’t supposed to comeback once you closed it. We’ll figure out a better way to do that without irritating our readers (and ourselves when we’re working on a story). Sometimes the best intentions meet up with technology that doesn’t quite cut it. Chuck and Staff, Looks great, feels great. The kinks will work themselves out over time. Love it. I really like the new format, I usually read it on my Kindle and it fit perfectly. Welcome back to the great state of Washington. We live in Anacortes. Early in my life I traveled with my husband for work all around the USA. With 2children. You miss a home base. An RV is not a home ,but a temporary residence. Glad you had a great time. You did learn a lot and will have a better prospective now and both scenarios. We have a Winnebago, and love moving most every month with 400 miles. Like your work on the new site and newsletter….. but… the pop ups will drive me away! Please take them away, they’re annoying. Also consider returning your “read more” links to opening a new tab so the base newsletter is always available without needing to hit a back link. I like the new format and that it doesn’t open up new tabs every time I click a link. I like to be able to just hit the back button to go back to where I left off. Thank you. I agree with Brian and disagree with Dr4Film (what kind of name is that anyway). Hitting the back arrow is much more convenient than closing a tab. Nice format to the NEW newsletter. However, please inform your IT web site manager that when there is a Hot Link, it should open up in another TAB, not in the same tab. Very inconvenient the way it has been programmed now. Thank you! Keith, I respectfully have to disagree however you are wrong on this point. Go back to issue 869 and click on EVERY hot link under the Almost Breaking News. Every article opens up in a NEW TAB. It has nothing to do with whatever browser one is using. That feature is embedded in the coding. OK, Diane. I guess that is called “progress” which can only move forward never backward. Thanks for the clarification. CTRL+Click and the link will always open in a new tab. I use these almost all the time and on nearly every site. Chuck – Like the new site except the ‘more stories’ keeps popping up in the bottom right hand corner. Anyway to disable this with 1 click? Hi Steve, we hear you loud and clear. It’s gone! Nice job on the Newsletter upgrade. Used on my iPad mini without problems! The text of the newsletter this week is very faint and difficult to read, especially with my old eyes. Yes I would totally agree with Tom, as having at least blacker print would help these old tired eyes! Thanks for this great new newsletter format! For some reason I think the format used to be kinda like this!? If you use Windows10, Go to “Settings” then “Ease of Access.” You can make test bigger, change the contrast, and other helpful things. You can use the zoom feature on your browser. Windows also has settings to use a magnifier. I have the same issue with almost every web site I visit. I use Google Chrome as my main browser, but I’m not certain what you force if any. There is an attachment that allows me to increase the contrast, change colors or a number of other things. I’m going to try this site in an Edge browser and a Firefox browser to see whether the dim text is a browser issue. Keep up the good work. The font needs to be darker for sure. The suggestions that users zoom or fiddle settings on their browsers or OS is a denial of the graphical design or typographical short coming. Should hundreds have to make changes or compensate endlessly instead of the one person correcting the readability mistake? Accept the feedback and facilitate for all to easily and thoroughly read this fine newsletter. I agree concerning the greyed-out type style. It reduces the contrast for no good reason, and makes the page difficult to read. Against a glaring white background, it becomes very hard on the eyes. Truth is, this is a very simple CSS (style sheet) option that the web designer can change. C’mon, Chuck… aren’t your eyes getting old under that “grey” hair we’re all sporting?